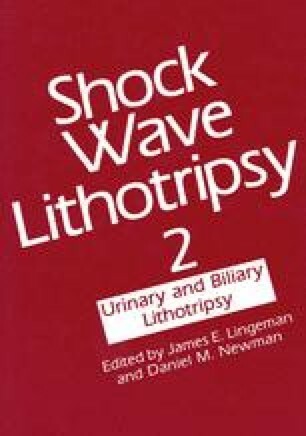 Extracorporeal shock wave lithotripsy (ESWL*) is successful in fragmenting gallstones, but less than 28% of patients with gallstone disease fulfill the criteria considered suitable for this treatment.1 Many patients are considered unsuitable because their stones are radiopaque, more than three in number, or larger than 3 cm in diameter. However, no clinical studies have been done to substantiate these current selection criteria. In this study, an EDAP LT-01 lithotripter was employed in combination with dissolution therapy. The selection criteria were significantly broadened to include patients with radiolucent stones of any size and number, and radiopaque stones smaller than 3 cm in diameter. To date 88 patients with gallstones have received treatment. All patients received up to six sessions of piezoelectric lithotripsy (PEL) (6,000 shock waves per session) without sedation or analgesia. Early results demonstrated complete gallstone clearance in 29 patients (mean follow-up 6.3 months) and more than 50% clearance in 14 patients (mean follow-up, 6.7 months) still undergoing therapy. Of those patients with a successful outcome, only 13 would have satisfied traditional selection criteria. There were no significant complications. This study suggests that the previously accepted selection criteria underestimate the number of patients suitable for gallstone ESWL and dissolution therapy.